Cebu Pacific Promo Fares 2019 to 2020: Piso Fare 2012! Cebu Pacific Piso Fare is open! Book today, April 4 to April 5 only!!! Hurry! This is any domestic destination! 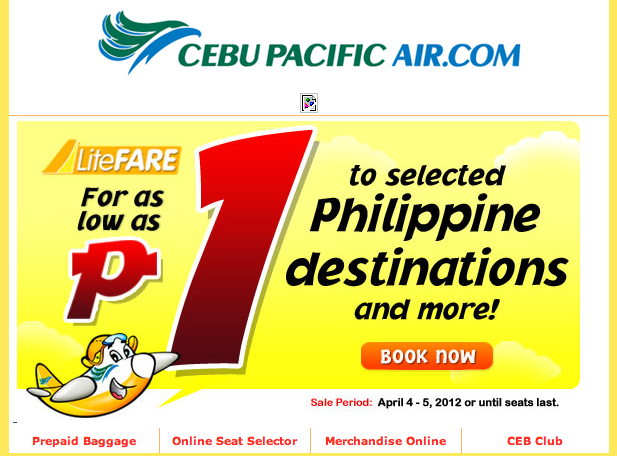 The Philippines’ largest national flag carrier, Cebu Pacific (PSE:CEB) offers P1 fares for 26 Philippine routes, starting April 4, 2012 until seats last. This seat sale is valid for travel from September 1 to December 15, 2012. P1 fares are available to travelers from Manila to Cauayan, Laoag, Legazpi, Naga, San Jose, Tuguegarao and Virac. The same fare can be enjoyed by those coming from Cebu going to Bacolod, Butuan, Cagayan de Oro, Clark, Davao, Dipolog, Dumaguete, General Santos, Kalibo, Ozamiz, Pagadian, Surigao, Tacloban, or Zamboanga. P1 fares are also available for seats from Cagayan de Oro to Iloilo, Davao to Iloilo, Davao to Zamboanga, Zamboanga to Tawi-Tawi, or Davao to Cagayan de Oro. “At CEBU PACIFIC, we make sure that we offer the lowest fares in all the markets we fly to, for the benefit of even more air travelers. Last year, we offered seat sales as low as P0, P0.88; and today P1 fares. We look forward to providing even more Filipinos the opportunity to fly via CEB’s widest network of Philippine and ASEAN routes at our trademark low fares,” said CEB VP for Marketing and Distribution Candice Iyog. Other Philippine routes with discounted seats are available for travel during the whole month of May. Travelers from Manila to Butuan, Cotabato, Cagayan de Oro, Zamboanga, General Santos, Pagadian or Ozamiz, can get discounted seats for as low as P888. International routesare also covered in this seat sale for the travel period: June 1 to August 31, 2012. Seats from Clark to Bangkok are available at the reduced fare of P688. Discounted seats from Manila to Hanoi, Saigon, Siam Reap and Bangkok are up for grabs for as low as P1088.